Askja is a late Pleistocene to Holocene volcanic centre in the middle of the Eastern Rift-Zone of Iceland (ERZ). One of the major present spreading fissure swarms of the ERZ runs from the volcanic centre about 80 km towards the NNE. Anomalous volcanic productivity in the Askja-area during the late Pleistocene formed a massif of superimposed subglacial palagonite ridges known as Dyngjufjöll. Olivine tholeiites with large plagioclase porphyritic units dominate the early production in the area. During the last glaciation a subcircular caldera (50 km2) started to form in the centre of the Dyngjufjöll massif. Few outcrops of silicic rocks surround the caldera structure but the principal intra-caldera volcanism produces qz-tholeiitic lavas. A large Holocene lava apron, exposed on the eastern flank of the centre, is assumed to have formed prior to the main caldera collapse. This lava sequence ranges from olivine tholeiites at its base towards qz-tholeiites in the most recent flow units. A large silicic eruption occurred in Askja about 9 kyr ago as inferred from a thick silicic ash layer in the area. This might be the event that significantly contributed to the subsidence of the present caldera floor. A nested caldera (12 km2) formed within the SE-quarter of the Askja caldera during a major Plinian dacite eruption in 1875 associated with a rifting episode along the Askja fissure swarm. 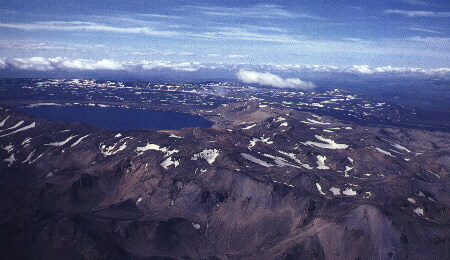 The water-filled caldera is known as Lake Askja (depth 220 m) or the Knebel caldera. The Plinian 1875 eruption produced a globally dispersed ash that was recorded in Scandinavia. A large steam-explosion crater (Víti) formed on the margin of the nested caldera during the 1875 eruption. Hydrothermal fumaroles are found within the Víti crater and fumarole activity is also exposed along the eastern shore of Lake Askja. During most of the Holocene the qz-tholeiite lavas that formed at the caldera rims have flooded the caldera floor. The most recent volcanic activity is mostly confined the eastern rim where a few minor basaltic eruptions occurred within the caldera wall around 1930. The last eruption occurred on the lowest part of the caldera rim in 1961 when qz-tholeiite lava flowed down the eastern flank of the volcano. Compiled by Níels Óskarsson in February 2011.